Wholesale Trader of a wide range of products which include 10/100/1000base gigabit single-mode fiber converter, drilling mud detergent, scale inhibitor, oil line corrosion inhibitor, gas line corrosion inhibitor and water injection corrosion inhibitor. Cadyce is a registered trademark. 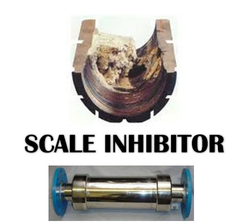 our clients can avail form us scale inhibitor. Salt content of sea water on an average of 3. 5%. In addition to this, sea water contains about 13 ppm strontium, 65 ppm bromine and trace amount of many. Strontium forms a sparingly soluble compound with sulfate solubility of stantium sulfate in water is 114 mg/lit at the temperature of 25ºc. That is less than calcium sulfate, which is 2630 mg/ht. Expressed as 2h2o, caso4 and more than barium sulfate that has solubility of 2. 3 mg/lit. will be free flowing liquid at ambient temperature(18 - 30ºc) free from foreign matter. will be completely miscible and compatible with sea water and formation water. will pass compatibility test when used in combination with other water flood chemicals such as polyelectrolytes, defoamers, oxygen scavengers, corrosion inhibitors and bactericides. solution a b (compo- sitions given below) containing scaling ions are mixed in presence of 10mg/litre of scaled inhibitor and placed for 18 hrs. At 65ºc, percentage scale inhibition should be 98% min. lacquer coated m. S. Drums, capacity 55 gallons each drum. We have gained expertise in providing our clients with a comprehensive range of Oil Line Corrosion Inhibitors, which is formulated using organic specified amines with dispersants. As in almost all oil processing companies corrosion in pipelines, drillings and flowlines is found regularly. For this, we have developed an advanced range of non-corrosive coronil-ol that gives a tough film in the pipeline. In pipelines, if the velocity of flow is less then required for turbulent flow, liquids will not contact top area. For this, in most cases free liquid moves along the bottom of pipe, which depends upon velocity the layer that may be both condensate and water or as discrete layers of oil and water. Soluble in water, sea water & formation water in Proportion. CORONIL 35 is an Oil soluble water dispersible semipolar organic inhibitor,which is very effective for sweet (CO2) or Sour (H2S) gas condensate wells and sweet and sour oil wells. large Quantities of water is been used in the Oil fields for flooding. This water normally contain about 3 - 3.2%. Sodium Chloride because of which water becomes highly corrosive. To prevent this corrosion this can be used. In the process of drilling, the drill string becomes differentially stuck, then there are only three options remaining to free it. 3. Hydrostatic pressure can be reduced. In general, penetration of oil based spotting fluids into the filter cake accompanied by dehydration and cracking results in reduction of a differential pressure across the drill string. Spotting fluids are generally positioned in the open hole to completely cover the problem area. 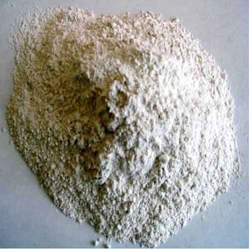 emulsion / salt water-in-oil emulsion) in refinery and oil field industry. *Properties mentioned and color shown in the photo above is for general idea of the product. Actual product property may vary. batch or continuous manner. The effective dose is 20 to 200 ppm and precisely it may be 100120ppm. 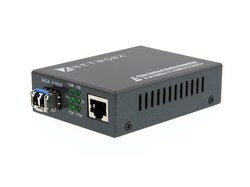 detailed information about this product (available on request). Packing: 3AM-CI-203 is available in 45Kg Carboy and 190Kg hdpe drums or iso-tankers. We are supplier of O. S. D. 101 - oil spill dispersant. there are several ways to tackle oil spill at sea. The best method is to collect the oil and physically recover it from the water. However, mechanical recovery of oil is not feasible in rough weather conditions. Secondly, cost of oil cleanup by mechanical means is high as compared to chemical clean up methods. The frictional resistance generated by rotating the drill string against the formation or casing may require extra torque if the hole is crooked or directional, considerable friction resistance to raising and lowering the drill string may also occur. Under certain conditions, such as in highly deviated holesw, holes with different charges in direction, undergauge holes or poor drill string dynamics, increased torque and drag entail a high risk of lost rig time, expensive pipe recovery operations and limitations in well developemnts. Expensive torque required to rotate the pipe generates greater strain on the drill pipe with the danger of twist – off. Sometimes, another problem occurs when drill pipe sticks to the wall of bore – hole. This may be caused by running or pulling pipe into the undergauge section of the hole, a key seat or a bridge of caving. Under certain circumstances differential pressure sticking may also occur when the drill pipe becomes motionless against a permiable formation and a portion of the contact area of the pipe is isolated by the filter cake. To overcome these difficulties, drilling fluids are treated with mud lubricants. Mud lubricants made by 3A has following properties. Acids are generally used in oil and gas wells to stimulate the Oil or Gas flow from the well and to remove incrustations in the wells. Acids , preferentially, hydrochloricn acid is are forced under high pressure through the hole into the rock formation to produce fracture around the hole. About 10 -15 % of hydrochloric acid is generally used for producing fracture. When the deposit is calcareous. When such a large quantity of hydrochloric acid is used, it is needless to say that well equipment should be protected from corrosion by use of inhibitor. 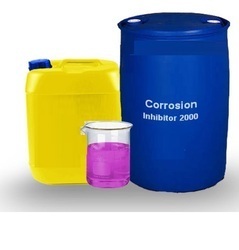 Acid corrosion inhibitor formulated by 3A is an acid corrosion inhibitor which is stable upto 120ºC. It is also used in various other industries where corrsion occures in pipe line such as sugar industry etc.